All transactions are safe and secure with a reliable history in online purchasing behind each of our associates. Buy the G.I. Joe Snake Eyes Comic Art t-shirt to own G.I. Joe clothing and merchandise. The Storm Shadow and Snake Eyes tees displayed here show the comic and box art for these two popular G.I. Joe action figures. Snake Eyes is standing and drawing his sword. The comic art shirts feature him with his wolf Timber. Storm Shadow is holding two swords. Purchase one of these tees with a G.I. Joe Cobra t-shirt to impress Cobra Commander. In the G.I. Joe cartoon Cobra Commander covers his face to conceal disfigurement, while in the G.I. Joe comic book he hides his face to protect his identity. Wear this under a Cobra G.I. Joe sweatshirt hoodie. In addition to the G.I. 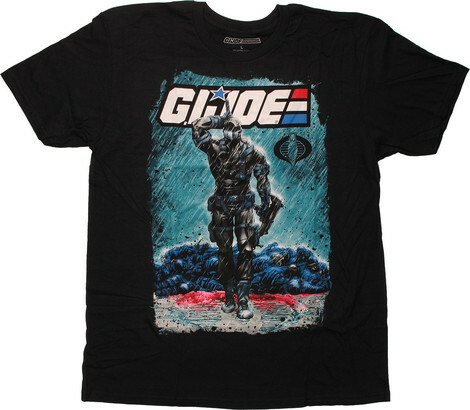 Joe Snake Eyes Comic Art tee above, browse the G.I. Joe Clothing Gallery for more apparel like men's and women's clothes, kids shirts or hoodies.